No light to beat – Roundabouts are designed to promote a continuous, circular flow of traffic. Drivers need only yield to traffic before entering a roundabout; if there is no traffic in the roundabout, drivers are not required to stop. Because traffic is constantly flowing through the intersection, drivers don’t have the incentive to speed up to try and “beat the light,” like they might at a traditional intersection. One-way travel – Roads entering a roundabout are gently curved to direct drivers into the intersection and help them travel counterclockwise around the roundabout. The curved roads and one-way travel around the roundabout eliminate the possibility for T-bone and head-on collision. Sarasota has two very old versions of CIRCLES: St. Armands Circle and the Tuttle/Siesta Drive Circle. Compare, modern roundabouts have no stop signs, much smaller centers, and no parking inside the roundabout. TOURISTS, SENIORS, & DRIVERS HERE WILL NEVER GET IT. Studies report attitudes before and after roundabouts are installed shift from approx. 2/3 opposed “before” to approx. 3/4 “for” after the roundabouts have opened to users. Seniors become advocates for more roundabouts because the traffic is moving the speed they want to go – SLOWER. Tourists are more familiar with roundabouts than the locals, especially visitors from Europe. Roundabouts are designed to handle traffic more efficiently than signalized intersections. With traffic constantly moving and vehicles entering the intersection at lower speeds, more vehicles are able to move through the intersection at any given time. With more vehicles able to move through the intersection at any given time, there will be fewer vehicles idling for shorter periods of time. Because idling vehicles cause the most air pollution, roundabouts result in reduced air pollution. Why do roundabouts have such a good safety record? 1. Conflicts are reduced. 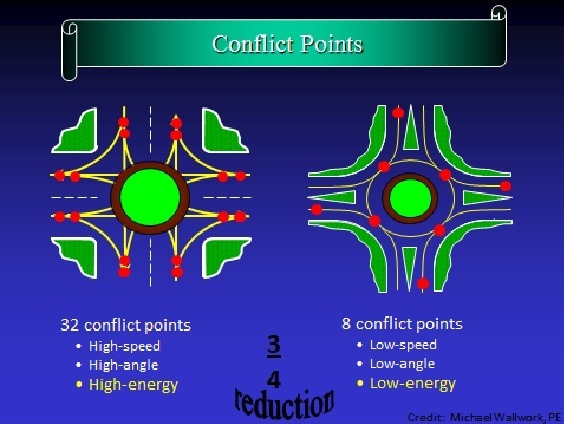 With fewer conflict points, roundabouts eliminate the potential for hazardous conflicts, such as right angle and left-turn head-on crashes. 2. Speeds are reduced and are more consistent. Low speeds in roundabouts allow drivers more time to react to potential conflicts, thus helping to improve the safety of roundabouts. 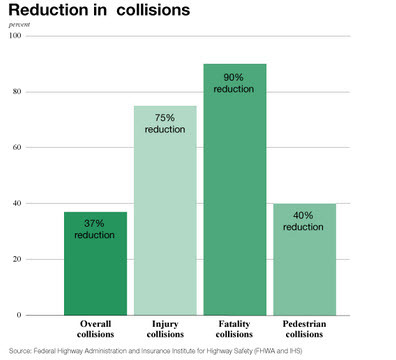 Since most drivers travel at similar speeds through roundabouts, crash severity is reduced compared to traditional intersections. 3. Pedestrians cross one direction of traffic at a time. Pedestrians need only cross one direction of traffic at a time at each roundabout approach with “safe harbor” to pause in the median, not so at signalized intersections. 4. No red lights to run! Police post video by red light camera. click Accident Sends Car Airborne: Caught on Tape Red light cameras have not reduced red light running to zero. Modern roundabouts do.